A polyhedral torus can be constructed to approximate a torus surface, from a net of quadrilateral faces, like this 6x4 example. In geometry, a toroidal polyhedron is a polyhedron which is also a toroid (a g-holed torus), having a topological genus of 1 or greater. Notable examples include the Császár and Szilassi polyhedra. Toroidal polyhedra are defined as collections of polygons that meet at their edges and vertices, forming a manifold as they do. That is, each edge should be shared by exactly two polygons, and the link of each vertex should be a single cycle that alternates between the edges and polygons that meet at that vertex. For toroidal polyhedra, this manifold is an orientable surface. Some authors restrict the phrase "toroidal polyhedra" to mean more specifically polyhedra topologically equivalent to the (genus 1) torus. In this area, it is important to distinguish embedded toroidal polyhedra, whose faces are flat polygons in three-dimensional Euclidean space that do not cross themselves or each other, from abstract polyhedra, topological surfaces without any specified geometric realization. Intermediate between these two extremes are polyhedra formed by geometric polygons or star polygons in Euclidean space that are allowed to cross each other. In all of these cases the toroidal nature of a polyhedron can be verified by its orientability and by its Euler characteristic being non-positive. Interactive Szilassi polyhedron model with each face a different colour. In the SVG image, move the mouse left and right to rotate it. Interactive Csaszar polyhedron model. In the SVG image, move the mouse to rotate it. Two of the simplest possible embedded toroidal polyhedra are the Császár and Szilassi polyhedra. The Császár polyhedron is a seven-vertex toroidal polyhedron with 21 edges and 14 triangular faces. It and the tetrahedron are the only known polyhedra in which every possible line segment connecting two vertices forms an edge of the polyhedron. 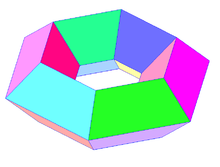 Its dual, the Szilassi polyhedron, has seven hexagonal faces that are all adjacent to each other, hence providing the existence half of the theorem that the maximum number of colors needed for a map on a (genus one) torus is seven. The Császár polyhedron has the fewest possible vertices of any embedded toroidal polyhedron, and the Szilassi polyhedron has the fewest possible faces of any embedded toroidal polyhedron. A special category of toroidal polyhedra are constructed exclusively by regular polygon faces, without crossings, and with a further restriction that adjacent faces may not lie in the same plane as each other. These are called Stewart toroids, named after Bonnie Stewart, who studied them intensively. They are analogous to the Johnson solids in the case of convex polyhedra; however, unlike the Johnson solids, there are infinitely many Stewart toroids. They include also toroidal deltahedra, polyhedra whose faces are all equilateral triangles. A restricted class of Stewart toroids, also defined by Stewart, are the quasi-convex toroidal polyhedra. These are Stewart toroids that include all of the edges of their convex hulls. For such a polyhedron, each face of the convex hull either lies on the surface of the toroid, or is a polygon all of whose edges lie on the surface of the toroid. A polyhedron that is formed by a system of crossing polygons corresponds to an abstract topological manifold formed by its polygons and their system of shared edges and vertices, and the genus of the polyhedron may be determined from this abstract manifold. Examples include the genus-1 octahemioctahedron, the genus-3 small cubicuboctahedron, and the genus-4 great dodecahedron. Pentagonal stephanoid. This stephanoid has pentagonal dihedral symmetry and has the same vertices as the uniform pentagonal prism. A crown polyhedron or stephanoid is a toroidal polyhedron which is also noble, being both isogonal (equal vertices) and isohedral (equal faces). Crown polyhedra are self-intersecting and topologically self-dual. ^ Webber, William T. (1997), "Monohedral idemvalent polyhedra that are toroids", Geometriae Dedicata, 67 (1): 31–44, doi:10.1023/A:1004997029852, MR 1468859 . ^ Whiteley, Walter (1979), "Realizability of polyhedra" (PDF), Structural Topology (1): 46–58, 73, MR 0621628 . ^ Császár, A. (1949), "A polyhedron without diagonals", Acta Sci. Math. Szeged, 13: 140–142 . ^ Ziegler, Günter M. (2008), "Polyhedral Surfaces of High Genus", in Bobenko, A. I.; Schröder, P.; Sullivan, J. M.; Ziegler, G. M. (eds. ), Discrete Differential Geometry, Oberwolfach Seminars, 38, Springer-Verlag, pp. 191–213, arXiv:math.MG/0412093, doi:10.1007/978-3-7643-8621-4_10, ISBN 978-3-7643-8620-7 . ^ Szilassi, Lajos (1986), "Regular toroids" (PDF), Structural Topology, 13: 69–80 [permanent dead link]. ^ Webb, Robert (2000), "Stella: polyhedron navigator", Symmetry: Culture and Science, 11 (1–4): 231–268, MR 2001419 . ^ Stewart, B. M. (1980), Adventures Among the Toroids: A Study of Orientable Polyhedra with Regular Faces (2nd ed. ), B. M. Stewart, ISBN 978-0-686-11936-4 . ^ Stewart (1980), p. 15. ^ Stewart (1980), "Quasi-convexity and weak quasi-convexity", pp. 76–79. ^ Grünbaum, Branko (1994), "Polyhedra with Hollow Faces", Polytopes: Abstract, Convex and Computational, NATO ASI Series C: Mathematical and Physical Series, 440, Kluwer Academic Publishers, pp. 43–70, doi:10.1007/978-94-011-0924-6_3 . See in particular p. 60. Weisstein, Eric W. "Toroidal polyhedron". MathWorld.